Manaslu Circuit Trek is an adventurous trek that makes a complete circuit of Mt. Manalsu (8156m), eighth highest mountain in the world. The trail reaches up to Manaslu Base Camp (4665m) which offers breathtaking and close-up views of Mt. Manaslu, Larkya peak, Samdo, Nireyka, Khayang, Saula. The most challenging moment of Manaslu Circuit Trek is the crossing of Larkey Pass at an altitude of 5106m. Manaslu Circuit Trek is still a very remote trek and very few trekkers visit this trail. Manaslu Circuit Trek is often preferred as a good alternative to Annapurna trek. The trekking trail follows the Budi Gandaki river and ascends towards Marshyangdi Valley. The region is geographically and culturally close to Tibet as the inhabitants of this region still follow ancient Buddhist culture. Some of the prominent villages you will pass through include Jagat, Shyala, Samagaon, Tilche, Lo Gaon among others. Since the trail falls within the territory of Manaslu Conservation Area, it is home to such endangered species as snow leopard, red panda, blue sheep, Himalayan Thar etc. Manaslu Trek is a teahouse trek. The actual trekking begins from Arughat in Gorkha district, some 8 hours drive from Kathmandu, on the banks of Budi Gandaki River. Ever since a dip in tourist arrival in Manaslu region following the April earthquake of 2015 the trekking the trail has been opened for trekking again. There has been growing interests among trekkers in Manaslu region and Manaslu Circuit trek in particular in the past few years. 00.00 pm: Pick up from airport, and proceed to hotel to check in. Our representative meets you at the hotel with your trek guide. You will have short trek talk and introduction. Guide will check your gears for the trek. If any shortage, he will help or advice to get it in local shops. NOTE: Your hotel is located at Thamel area. Tourist can explore at own during night time. EyesOnNepal recommends some famous restaurants (on 10 to 20 minutes walking distance) for wining, dining and Nepalese coffee. Or, our tour guide will bring you around in Thamel area, and will explain where to make shopping, where to dine, where can find good restaurant, famous bars etc. 2) Boudhanath Stupa – The largest stupa in Nepal and the holiest Tibetan Buddhist temple outside Tibet. NOTE: UNESCO WORLD HERITAGE SITE. 4) Patan Durbar Square NOTE: UNESCO WORLD HERITAGE SITE. 5) Kathmandu Durbar Square NOTE: UNESCO WORLD HERITAGE SITE. 08.00am: Drive to Aurghat(570m) by Jeep. The total distance covered from Kathmandu to Arughat is 140km. 12.00pm: Arrive at Dhadingbesi(580m), district headquarters of Dhading district. Have lunch break and afterwards continue the drive to Arughat. On the way to Arughat you will see Ganesh Himal, Langtang and Manaslu Himalayan ranges. 02.00pm: Arrive at Arughat. Change the vehicle and drive towards Soti Khola(730m). The unpaved road passes along the banks of Budi Gandaki with soaring cliffs on both sides. 05.00pm: Arrive at Soti Khola. Check in at local teahouse and relax thereafter. Dinner will be served at the teahouse dining hall. Highlights: Trekking along the banks of Budi Gandakir River passing through village settlements. 08.00am: The first day of trek begins. Follow your trekking guide as he will lead you through the rugged trails by the banks of Budi Gandaki River. On the way you will pass by village of Armala and Riding of mix ethnic groups including Gurung, Bahun etc. You will walk through green terraced farms etc. 10.30am: 30 minute tea breaks at Lapubeshi(880m) before you continue trekking. The trail further descends down to a valley by Budhi Gandaki river on a gravel stone path. Crossing a suspension bridge over a river leads you to Machakhola gaon (a village known for fishes). 02.30pm: You will arrive at Macchakhola Vilalge (930m). Late afternoon you can go around the village on self exploration or under guidance. Lunch, Dinner and overnight in teahouse in Machha Khola. 07.00am: Breakfast at tea house. 08.00am: Trekking begins. Shortly you reach Tharo Khola beyond which is the village of Khorlabeshi(970m). Continue the trail to Dovan via Tatopani, a small hot spring by the trail. Take a lunch break at Dovan(1070m). 01.00pm: Resume trekking after lunch. It will take another 3 hours to reach Jagat from Dovan. Along the route you will trek through waterfalls, farmed terraces and thatched roof villages before you come upon a suspension bridge over Yaru Khola. Another 30 minutes walk will reach you Thado Bharyang which is the last village before you get to Jagat(1342m). Jagat is the entry point of Manaslu Conservation Area which has post office, school and village offices. Evening tea, dinner and overnight at local hotel/ tea house in Jagat. Highlights: Trekking along the banks of Budi Gandakir River passing through village settlements and numerous fountains. 08.00am: Today you will be trekking from Jagat to Pewakhola(1700m). You will show your trekking permit at the Jagat office before you enter into Manaslu Conservation Area. Climb a rocky spur to Salleri(1360m)to catch the first glimpse of Ganesh Himal on your right before descending down to Sirdibas(1430m). 10.30am: Arrive at Sirdibas. It is an uphill trek all the way to Phillim. Phillim(1590m) is a local village with its own health post, police check point, school etc. 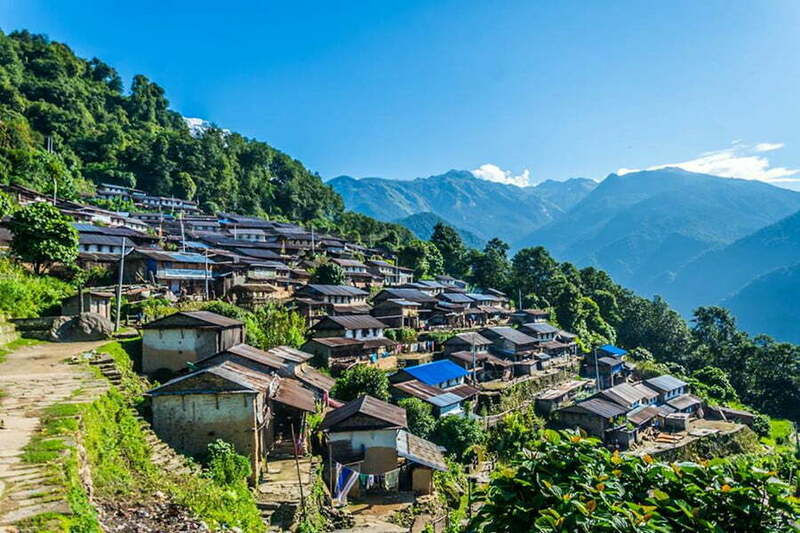 The village’s main inhabitants comprise of Tamang, chetri, Bramhim etc. You will take a tea break at Phillim. 12.00pm: Continue the trek to Chisapani. As you walk, do not miss catching a view of beautiful Nyak Village. 01.00pm: Arrive at Chisapani for lunch break. There are 3 hotels available for lunch. 02.00pm: Continue the trek towards Pewakhola. You will come across many natural fountains on this section of the trail. Note: The trail here forks into one going to Tsum Valley and Ganesh himal and the other towards Pewakhola/Manaslu base camp. 05.00pm: Arrive at Pewakhola. Pewakhola is a camping site bang on in the middle of a forest. Dinner and overnight at a teahouse in Pewakhola. 08.00am: The trail ahead continues parallel to the Budi Gandaki River. The section from Pewakhola to Dyang passes through pine forests. 09.30: Arrive at Dyang(1860) and continue trek to Ranagaon. Ranagaon is a remote village of ethnic Gurung settlement. From here it is another 1 hour walking distance to reach Bihi village. 12.00pm: Lunch break at Bihi(2130m). 01.00pm: Continue trek leaving Bihi behind. You will pass by few tea shops and small villages until you reach Ghap. 03.00pm: Arrive at Ghap village(2160m), our stopover for the night. You can either rest for the day or go for a short hiking to Prok Village nearby, which is famous for an old Buddhist monastery. The journey from Ghap to Prok and back takes about 3 hrs. 08.00am: Start the trekking for Namrung village (2660m). The trail passes through a dense rhododendrons and bamboo and fields of potato and buckwheat farming. Note: Namrung is a typical Tibetan village. The residents of Namrung still practices centuries old Buddhist rituals. You can visit local monastery and Chortens. Have a lunch break. 12.00pm: Continue the trek ahead. You will walk past Sho village(2950m), another Tibetan village, which offers spectacular views of Boudha Himal, Hiunchuli and Ngadi Chuli. It will take about 3 hours to reach Lo Gaon(3180m). Note: Lo Gaon is also a Tibetan village and is an attraction for anyone who are interested in Tibetan Buddhism. One can also enjoy the breathtaking views of Manaslu. 03.00pm: Arrive at Lo Gaon and check in at a local teahouse. Rest and Relax. Dinner at the teahouse/ Local Hotel. Highlights: Trek to Samagaon, the entrance to Mt. Manaslu expedidtion. 08.00am: Trek from Lo Gaon to Shala (3520m), which takes about 2.30hrs. 10.30am: Tea break at Shala. After tea break continue the trek to Samagaon (3530m). 01.00pm: Arrive at Samagaon. Samagaon is the entry route for Manaslu Expeditions that are interested in reaching Manaslu Base Camp (4400m). Note: Samagaon is our resting point for the day. Those who are not tired and are interested in sightseeing around can hike up to Punggen Gompa and return. The ordeal takes about 3 hours. Back in 1953 when Japanese expedition was attempting to climb Mt. Manaslu, somewhat mysteriously the Punggen Gompa got destroyed. The local interpreted it as a sign of God’s anger against the idea of climbing Manaslu. The next year when the Japanese expedition returned to climb Manaslu, the locals barred them from climbing and even attacked the expedition. Highlights: Trek to Manaslu Base Camp and Birendra Lake and return to Samagaon. 08.00am: Today is set for acclimatization. If you have a dream of reaching Manaslu Base Camp, your guide will guide you to the base of Mt. Manaslu. You will be able to see a magnificent panorama of Manaslu ranges including Manaslu I, II, III & IV, Peak 29 and Naike Peak etc. You can also visit Birendra Lake (3450m) as a sidetrip. 05.00pm: You will be back at Samagaon by late afternoon. Sip evening tea and relax. Dinner at the teahouse. 07.00am: Breakfast at tea house / hotel. 12.00pm: Arrive at Samdo village. Samdo falls on the salt trade route between Nepal and Tibet. Lunch break at Samdo. After lunch, you can either rest for the day or go one of the two hiking options. The first option is to trek up to the base of Samdo Peak or visit Samdo Glacier. Dinner at the teahouse. Highlights: Trek to Dharmashala (Larke Phedi), acclimatize and prepare yourself for the big day tomorrow. 08.00am: Begin trekking towards Dharmashala(4470m). Enroute you will stop over at Larke Bazaar. 09.30am: You will reach Larke Bazaar(4090m). Larke used to be a traditional market for commodities imported from Tibet and the locals were dependent on goods from Tibet for their livelihood. Today, the bazaar has dried up whilst Samdo is becoming a relatively vibrant market for goods. Continue trekking past Samdo towards Dharmashala. 12.00pm: Arrive at Dharmashala, also known as Larke Phedi. It is the last point for rest before crossing Larke Pass. The place offers splendid views of Larke Himal. It is highly advised to take up side trips or hiking to nearby hilly ridges in order to acclimatize and prepare physically for the crossing of Larke La pass the following day. Lunch and Dinner at the teahouse. Note: There is only one teahouse in Dharmashala so you will have to sleep inside tents for overnight on a sharing basis. Highlights: Cross the Larke La pass (5106m) and drop down to Bimtang village. 04.00am: Breakfast at tea house(Local Lodge). 05.00am: Trekking starts early. You will carry a lunch pack with you. After walking about 3 hours, you will reach the pass. On the way you might come across a teahouse where you can take a tea break. The walk to the pass is uphill however the final stretch to the pass is a leveled path. The path continues to be horizontal until you start to descend. The climb down the pass is fraught with dangers since it is prone to snowfall even at the slightest change of weather. The descending trail is full of pebbles that often make walking difficult. It is advised to wear necessary gears to cross this section. 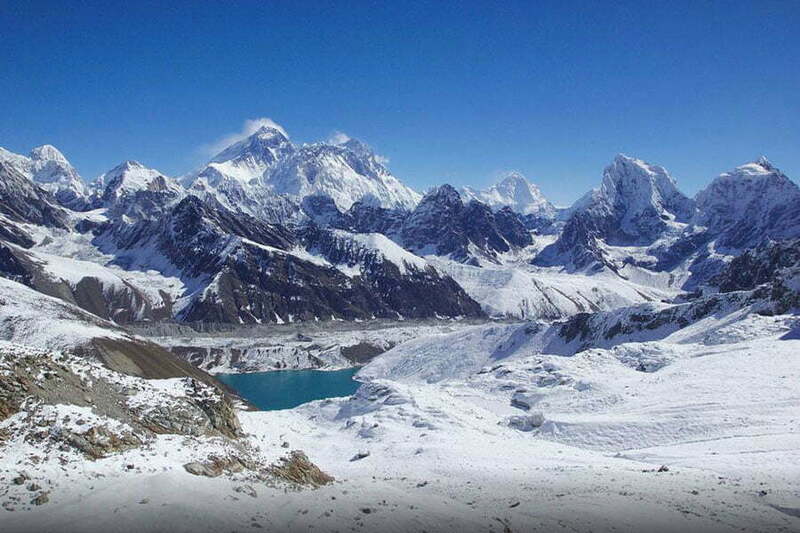 For the longest part of the pass, you will see amazing views of Kusumkhang, Himlung, and many other small peaks. It will take more than 6 hours to reach Bimtang(3720m) from the pass. There are no settlements between this section. 05.00pm: Arrive at Bimtang. Rest and Dinner at a teahouse. Bimtang is a small Gurung village that falls in Manang District (ACAP). 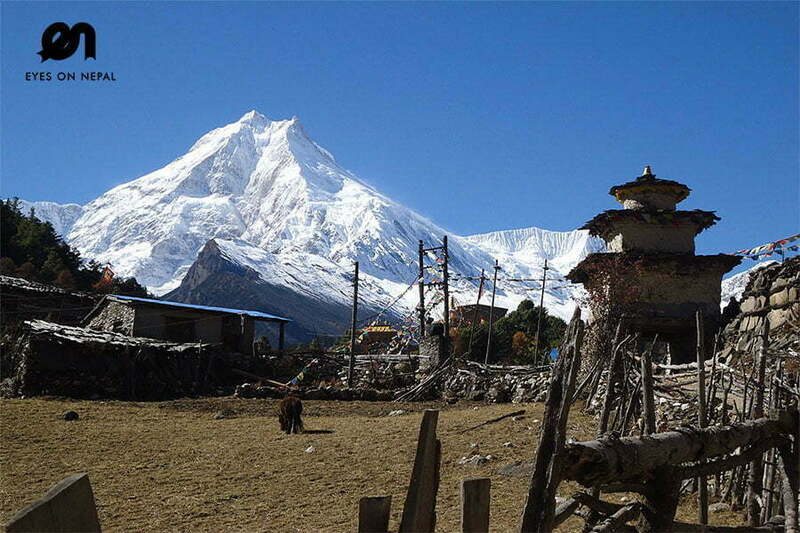 Highlights: Trek to Gho with amazing views of Manaslu North. 08.00am: Begin trekking towards Gho(2560m). This is a downhill trek and affords stunning view of Manaslu North and Phungge Himal. A 4 hrs descending trek reaches Suti Khola that involves walking through pine forest. Take a lunch break at Suti Khola. 01.00pm: Continue the trek towards Gho village. 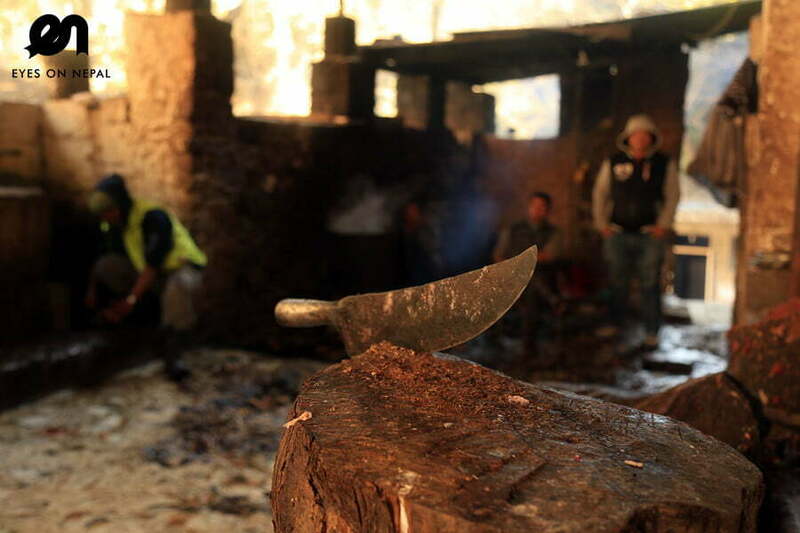 It will take about 1.5 hrs and trail passes through seasonal cattle sheds or kharka. 03.30pm: Arrive in Gho. 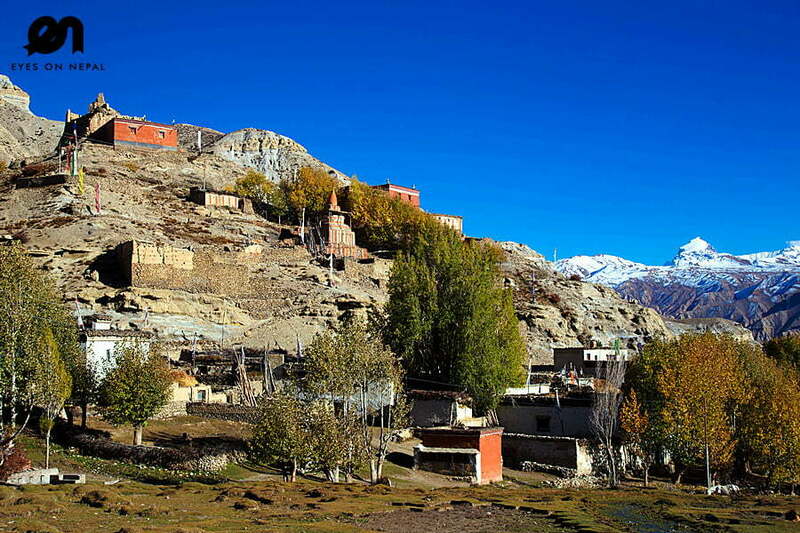 We recommend stopping at Gho village rather than heading further to Tilche village. The trek to Tilche is long and very tiring and can strain your legs too quickly. Gho village looks out to an impressive north face of Mt. Manalsu. Dinner and overnight at Gho. Highlights: Trek to Jagat besides Marshyangdi Khola on famous Annapurna Circuit route. 07.00am: Breakfast at local lodge/tea house. 08.00am: Trek from Gho to Tilche(2300m) takes about 1.5 hrs of downhill trek. It is further 1.5 hrs walk before you reach Darapani. Darapan(1860m) lies on the Annapurna trekking route and has a ACAP office, health post and school. 1. Continue trekking via old Annapurna trek route. We recommend this to you. 2. Continue trekking along the newly constructed Chame-Besisahar road. 3. Hire a jeep ride back to Besisahar. 12.00pm: Continue the trek from Darapani to Tal. Lunch break at Tal(1700m). 02.30pm: After lunch break, continue trek to Jagat(1300) via Chyamche village(1430m). 04.30pm: Arrive at Jagat. Dinner and overnight at a local lodge/tea house. 07.00am: Breakfast at teahouse/ Local lodge. 08.00am: Trek from Jagat to Syange(1100m) is a downhill trail and takes 1.5 hrs. 09.30: Arrive in Syange. Continue trek to Bahundanda(1310m) via Ghemu(1130m). Lunch break at Bahundanda. Option: You can take a ride to Bulbule(840m) from Syange which takes about 3 hrs. 01.00pm: Continue trek to Nadi Bazaar. Nadi Bazaar(930m) has better accommodation facilities than Bulbule as well as good views of BaudhaHimal, Himalchuli etc. 04.00pm: Arrive at Nadi Bazaar. Dinner and overnight at teahouse/ Local lodge in Nadi Bazaar. 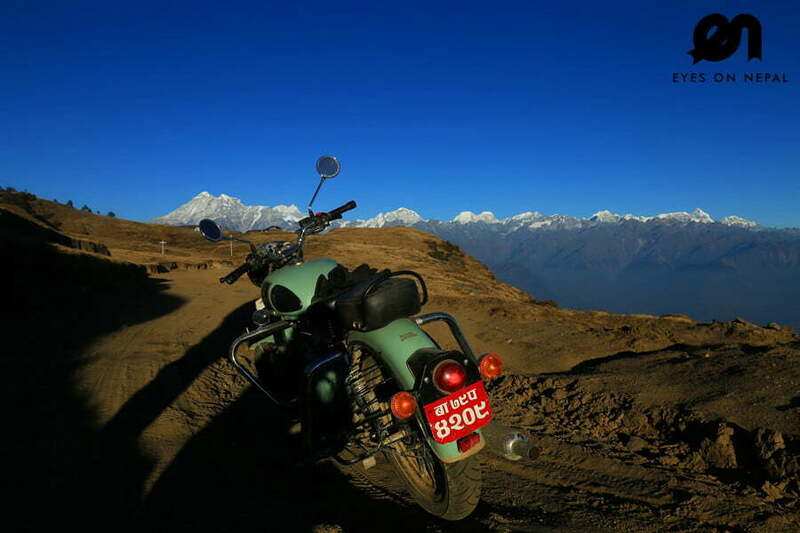 Highlights: Ride back to Kathmandu through scenic highways. 08.00am: Trek to Bulbule(840m) which is about 45 min distance. 09.00am: Arrive at Bulbule. Catch a private vehicle from Bulbule and drive all the way to Kathmandu. 12.00pm: Stop over at Dumre (400m) along Kathmandu-Pokhara highway for lunch break. Continue driving back to Kathmandu after lunch. 05.00pm: Arrive in Kathmandu. Check in a hotel in Kathmandu. Rest and Relax at your hotel. 07.00pm: Pick up from your hotel for farewell dinner at one of the finest restaurants in town. Enjoy food and drinks. Congratulation, your trek is successfully ends. Rest and Relax after Dinner. We suggest you to visit some of nice bar and pubs in Thamel area. 00.00 hrs. Breakfast at hotel. 00.00 hrs. Free & easy until transfer to airport. It’s time to say goodbye! Thank you very much for giving an opportunity to be your trek operator in Nepal. We hope to welcome back you for great Everest Base Camp Trek. • Accommodations x 15 nights in the mountains. NOTE: Base on twin sharing and in some of the places you will sleep at hall. It depends upon the touristic season. We will do our best to provide your own room. • All itinerary as on suggested itinerary. • 1 trekking guide & 1 porter (maximum 20 kg luggage) will be provided during your treks. • Salary, accommodations & meals for trekking guide and porter. • First aids kids, water purified tab & all necessary in the mountains. • Trekking Gears such as Sleeping Bag, Trekking Pole, Down Jacket, Crampons etc. Any expenses caused by reason beyond our control such as roadblock due to natural climates and accidents and unforeseen events etc.